A Giraffe Hero is a person who sticks his or her neck out on sustainable basis, for public good, at huge personal risk. Giraffe Heroes India Program is an off-shoot of non-profit Giraffe Heroes Project which was started in USA in 1984, by Ann Medlock. 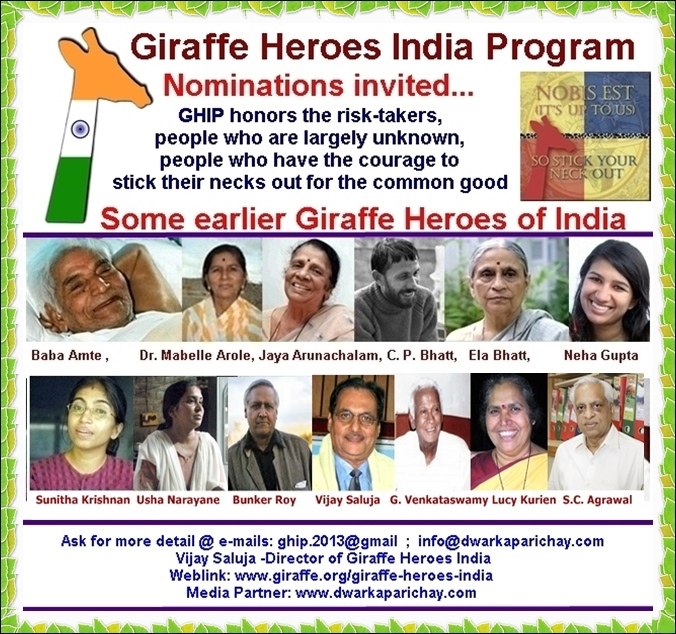 The aim of starting this Project was to find out unknown heroes of the society, commend them as Giraffes for sticking their necks out & get their stories told on radio, television & in print. Giraffe stories would tell the people that there was headway being made on the problems of the world, that there were individuals who had solutions & the courage to move into action. The stories would move people`s souls & get them moving on public problems that mattered to them. Some days back, a brief write up, about Giraffe Heroes India Programme (GHIP) was published in Dwarka Parichay, our media associate. This Programme, as some of the readers may recall, is about throwing light on UNSUNG HEROES of INDIA. www.giraffe.org/global/indiaGHIP is an associate of Giraffe Heroes Project of US. May I invite all the readers to visit the website & thereafter send nominations of deserving candidates. CAN WE AVERT THE ACCIDENTS? Answer is YES!